Secretary of State says U.S. ready to support direct negotiations between Afghanistan government and Taliban. 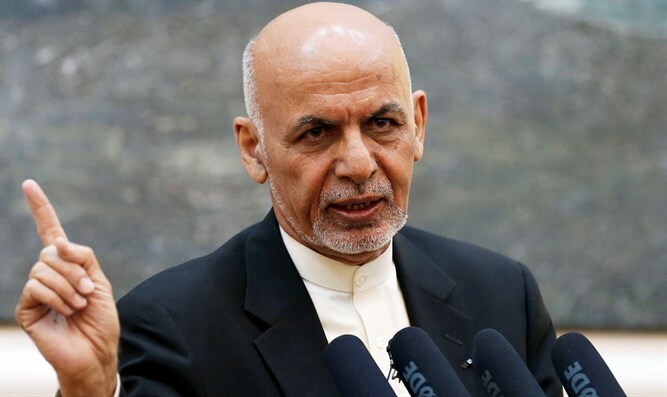 Afghan President Ashraf Ghani on Sunday declared a provisional three-month ceasefire with the Taliban in a televised broadcast, a move welcomed by Washington but yet to receive a reply from the group itself. The announcement followed a bloody week of fighting across Afghanistan which saw the Taliban launch a massive assault against the provincial capital Ghazni, reported AFP. Anticipation had been mounting ahead of Ghani's speech following mixed signals from the presidential palace over whether the government would offer a fresh truce following a brief, unprecedented ceasefire earlier in June. Ghani added that his administration removed "all obstacles" to peace with the announcement following consultations with religious scholars, political parties and civil society groups. But he said the truce would hold only if the insurgents reciprocated. "We call on the leadership of the Taliban to welcome the wishes of Afghans for a long lasting and real peace, and we urge them to get ready for peace talks based on Islamic values and principles," he said, according to AFP. U.S. Secretary of State Mike Pompeo welcomed Ghani's announcement and called on the Taliban to participate. "We remain ready to support, facilitate, and participate in direct negotiations between the Afghan government and the Taliban. There are no obstacles to talks. It is time for peace," he he said in a statement quoted by the news agency. NATO secretary general Jens Stoltenberg welcomed the announcement as well and tweeted, "I encourage the Taliban to demonstrate their concern for Afghans by respecting it." Ghani's announcement was also swiftly welcomed in neighboring Pakistan, which has long been accused of fostering links with the Taliban's leadership and providing sanctuary to its fighters. The June ceasefire, which was the first such truce in the country since the 2001 U.S. invasion, spurred hopes that a new path was opening for possible peace talks in the country to the end the nearly 17-year-old war. However, violence has surged in the weeks since as talk of a new ceasefire continued. Earlier this month, three members of NATO’s Resolute Support mission were killed when a Taliban suicide bomber stuck a foreign troops patrol in eastern Afghanistan. A U.S. serviceman and two Afghan soldiers were also injured. The Taliban did not immediately respond to the offer but in a message from its leader published over the weekend to mark the upcoming Islamic holiday of Eid al-Adha the group continued to push for direct talks with the U.S.
Washington has repeatedly refused, saying negotiations must be Afghan-led. Last month, however, Taliban representatives met American officials for talks in Qatar, though little is known about the details of the meeting. Last year, President Donald Trump stressed that he intended to employ a “fight to win” strategy which would include ratcheting up the fight against the Taliban in Afghanistan. In response, the Taliban threatened that "If America doesn´t withdraw its troops from Afghanistan, soon Afghanistan will become another graveyard for this superpower in the 21st century."